The following collection of Jewish legends concerning Eve and womankind is from Louis Ginzberg, The Legends of the Jews, trans. from the German by Henrietta Szold, volume 1 (Philadelphia: Jewish Publication Society, 1937), pp. 64-69. When Adam opened his eyes the first time, and beheld the world about him, he broke into praise of God, "How great are Thy works, O Lord!" But his admiration for the world surrounding him did not exceed the admiration all creatures conceived for Adam. They took him to be their creator, and they all came to offer him adoration. But he spoke: "Why do you come to worship me? Nay, you and I together will acknowledge the majesty and the might of Him who hath created us all. The Lord reigneth," he continued, "He is apparelled with majesty." And not alone the creatures on earth, even the angels thought Adam the lord of all, and they were about to salute him with "Holy, holy, holy, is the Lord of hosts," when God caused sleep to fall upon him, and then the angels knew that he was but a human being. The purpose of the sleep that enfolded Adam was to give him a wife, so that the human race might develop, and all creatures recognize the difference between God and man. When the earth heard what God had resolved to do, it began to tremble and quake. "I have not the strength," it said, "to provide food for the herd of Adam's descendants." But God pacified it with the words, "I and thou together, we will find food for the herd." Accordingly, time was divided between God and the earth; God took the night, and the earth took the day. Refreshing sleep nourishes and strengthens man, it affords him life and rest, while the earth brings forth produce with the help of God, who waters it. Yet man must work the earth to earn his food. The Divine resolution to bestow a companion on Adam met the wishes of man, who had been overcome by a feeling of isolation when the animals came to him in pairs to be named. 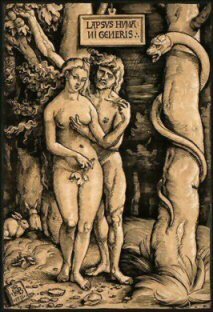 To banish his loneliness, Lilith was first given to Adam as wife. Like him she had been created out of the dust of the ground. But she remained with him only a short time, because she insisted upon enjoying full equality with her husband. She derived her rights from their identical origin. With the help of the Ineffable Name, which she pronounced, Lilith flew away from Adam, and vanished in the air. Adam complained before God that the wife He had given him had deserted him, and God sent forth three angels to capture her. They found her in the Red Sea, and they sought to make her go back with the threat that, unless she went, she would lose a hundred of her demon children daily by death. But Lilith preferred this punishment to living with Adam. She takes her revenge by injuring babes--baby boys during the first night of their life, while baby girls are exposed to her wicked designs until they are twenty days old. The only way to ward off the evil is to attach an amulet bearing the names of her three angel captors to the children, for such had been the agreement between them. The woman destined to become the true companion of man was taken from Adam's body, for "only when like is joined unto like the union is indissoluble." The creation of woman from man was possible because Adam originally had two faces, which were separated at the birth of Eve. When God was on the point of making Eve, He said: "I will not make her from the head of man, lest she carry her head high in arrogant pride; not from the eye, lest she be wanton-eyed; not from the ear, lest she be an eavesdropper; not from the neck, lest she be insolent; not from the mouth, lest she be a tattler; not from the heart, lest she be inclined to envy; not from the hand, lest she be a meddler; not from the foot, lest she be a gadabout. I will form her from a chaste portion of the body," and to every limb and organ as He formed it, God said, "Be chaste! Be chaste!" Nevertheless, in spite of the great caution used, woman has all the faults God tried to obviate. The daughters of Zion were haughty and walked with stretched forth necks and wanton eyes; Sarah was an eavesdropper in her own tent, when the angel spoke with Abraham; Miriam was a talebearer, accusing Moses; Rachel was envious of her sister Leah; Eve put out her hand to take the forbidden fruit, and Dinah was a gadabout. The physical formation of woman is far more complicated than that of man, as it must be for the function of child-bearing, and likewise the intelligence of woman matures more quickly than the intelligence of man. Many of the physical and psychical differences between the two sexes must be attributed to the fact that man was formed from the ground and woman from bone. Women need perfumes, while men do not; dust of the ground remains the same no matter how long it is kept; flesh, however, requires salt to keep it in good condition. The voice of women is shrill, not so the voice of men; when soft viands are cooked, no sound is heard, but let a bone be put in a pot, and at once it crackles. A man is easily placated, not so a woman; a few drops of water suffice to soften a clod of earth; a bone stays hard, and if it were to soak in water for days. The man must ask the woman to be his wife, and not the woman the man to be her husband, because it is man who has sustained the loss of his rib, and he sallies forth to make good his loss again. The very differences between the sexes in garb and social forms go back to the origin of man and woman for their reasons. Woman covers her hair in token of Eve's having brought sin into the world; she tries to hide her shame; and women precede men in a funeral cortege, because it was woman who brought death into the world. And the religious commands addressed to women alone are connected with the history of Eve. Adam was the heave offering of the world, and Eve defiled it. As expiation, all women are commanded to separate a heave offering from the dough. And because woman extinguished the light of man's soul, she is bidden to kindle the Sabbath light. Adam was first made to fall into a deep sleep before the rib for Eve was taken from his side. For, had he watched her creation, she would not have awakened love in him. To this day it is true that men do not appreciate the charms of women whom they have known and observed from childhood up. Indeed, God had created a wife for Adam before Eve, but he would not have her, because she had been made in his presence. Knowing well all the details of her formation, he was repelled by her. But when he roused himself from his profound sleep, and saw Eve before him in all her surprising beauty and grace, he exclaimed, "This is she who caused my heart to throb many a night!" Yet he discerned at once what the nature of woman was. She would, he knew, seek to carry her point with man either by entreaties and tears, or flattery and caresses. He said, therefore, "This is my never-silent bell!" The wedding of the first couple was celebrated with pomp never repeated in the whole course of history since. God Himself, before presenting her to Adam, attired and adorned Eve as a bride. Yea, He appealed to the angels, saying: "Come, let us perform services of friendship for Adam and his helpmate, for the world rests upon friendly services, and they are more pleasing in My sight than the sacrifices Israel will offer upon the altar." The angels accordingly surrounded the marriage canopy, and God pronounced the blessings upon the bridal couple, as the Hazan does under the Huppah. The angels then danced and played upon musical instruments before Adam and Eve in their ten bridal chambers of gold, pearls, and precious stones, which God had prepared for them. Adam called his wife Ishah, and himself he called Ish, abandoning the name Adam, which he had borne before the creation of Eve, for the reason that God added His own name Yah to the names of the man and the woman--Yod to Ish and He to Ishah--to indicate that as long as they walked in the ways of God and observed His commandments, His name would shield them against all harm. But if they went astray, His name would be withdrawn, and instead of Ish there would remain Esh, fire, a fire issuing from each and consuming the other.